Marginated tortoise is the largest European tortoise. Its shell is oblong and has a notable thickness around the middle of the body. The posterior end of the shell has a saw-like formation, flanged outward like a bell. The carapace of an adult specimen is almost completely black, with yellow highlights. The ventral shell is lighter-coloured and has pairs of triangular markings with the points facing the rear of the animal. Males are also often larger than the females. For indoor housing i highly recommend using Rubbermaid containers for the indoor set up while they are very young. For 2 to 3 hatchlings, a container roughly 0.6 x 0.9 meters (2 x 3 feet) will suffice. As the marginata grow, the size of the container can be increased to accommodate them. Fake plants or edible weeds may be grown in the indoor unit if you wish to do so. Housing larger juveniles indoors is possible especially during the winter. By using the “tortoise table” method, an 2.4 x 1.2 meters (8 x 4 feet) rectangular enclosure out of ply wood can easily be constructed. This will house up to 6 tortoises in the 0.10 to 0.15 meters (0.3 to 0.5 feet) range for part of the year but as always, going as big as possible is best. Adults are not recommended for indoor keeping unless you can go very big. Large pieces of cork bark or drift wood make for excellent decor inside the enclosure. Undoubtedly, Marginated tortoises are best suited for outdoor keeping especially as adults. . These animals can be successfully kept in an outdoor pen May through October in most parts of the country, if not longer. A larger enclosure at least 5 x 5 meters (16 x 16 feet) and 0.6 meters (2 feet) high will house a pair or trio. Several materials are suitable for building the retaining wall. Sloping areas and uneven terrain offer the tortoises a variety of basking or nesting sites and force them to exercise. Decor and plant life are very important for the outdoor home as well. Boulders, slate, river stone, drift wood, logs, cork bark and other natural pieces should be added wherever possible. Fountain grasses, maiden grasses, sedum, spirea, hosta, knockout rose, hibiscus and stone crop (to name a few) are excellent choices for planting the pen. Half logs, upside down tupperware with an entrance hole cut in, drift wood and cork bark make for excellent hide aways. These will be used frequently by the occupants. Larger rubbermaid containers turned upside down with an entrance hole cut into it can be made into a “humid hide” for young Marginated tortoises to help keep up with smooth shell growth. For outdoors housing In areas where weather isn’t very reliable, I recommend using cold frames or mini greenhouses for the tortoises to enter. A suitable substrate is clean top soil mixed with coconut coir or peat moss. This can be up to 0.1 meters (0.3 feet) deep to allow for burrowing. Burrowing is 100% normal! I also recommend adding cypress mulch as a 0.05 meters (0.15 feet) top layer but you can also mix it in to the existing substrate. For outdoors housing keeping them off excessively damp ground such as wet soil or a grassy lawn is important. It’s crucial for the ground to be well drained. I remove the existing soil inside the new pen and replace it with a mix of clean top soil, gravel and sand. The mix drains well and provides the tortoises with a more natural appeal. For lighting, a 10.0 UVB emitting fluorescent bulb should be fixed across the top of the enclosure. The tortoises should be subjected to 12-14 hours of light each day. A 100 watt basking light should also be placed at one end only to offer the tortoises a basking site of around 35 ºC (95 ºF). Ambient room temperature should hover around 26-29 ºC (80-85 ºF) during the day and can be allowed to drop around 21-23 ºC (71-73 ºF) at night. Additional heat sources like heat pads or rocks are terrible for tortoises and should never be used. I prefer to use 150 watt Mercury Vapor bulbs on older animals for basking. They are powerful and emit both UVA and UVB with heat. Depending on the size of the enclosure, you may want to use more than one basking light to offer the tortoises multiple basking areas. A heat lamp with a 250 watt infrared bulb can be installed inside them for even cooler days/nights for outdoor housing. A very shallow water tray 0.01 meters (0.03 feet) can also be provided to the babies so that they have constant access to fresh water. Drinking is crucial for baby Marginated tortoises and additional soaks for 15 minutes in lukewarm water, 3 to 4 times weekly is also wise. A stainless steel water dish no more than 0.05 meters (0.15 feet) deep for adults should be set into the cypress mulch so that the animals always have fresh water to drink and soak in. The mulch aids in keeping an adequate humidity level which should be around 70%. Do not let the substrate dry out entirely by keeping a spray bottle filled with water on hand to mist the enclosure. 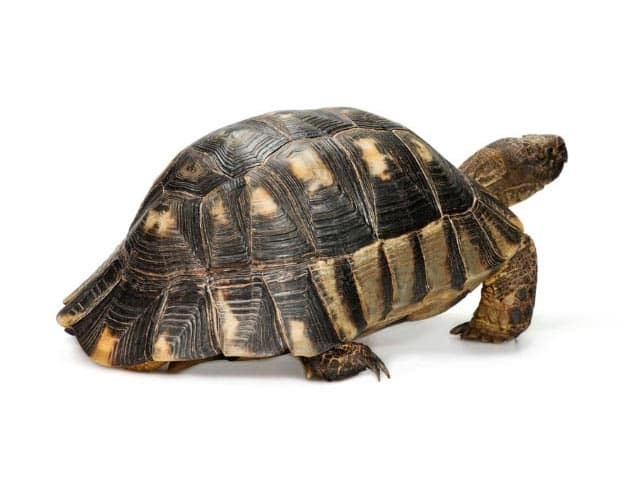 Low protein, high fiber and calcium rich are crucial points to keeping Marginated tortoises stable and healthy. Pesticide-free weeds grown in the yard such as dandelion, clover, plantain, catsear, thistle and vetch make for excellent food items. Mulberry leaves are also recommended. Here, we make sure our tortoises get Mazuri tortoise diet (original blend and LS blend) several times a week. This commercial diet aids in keeping a healthy weight on the animals, enables hatchlings to grow steadily and rapidly replenishes nutrients lost in females who have recently deposited eggs. For calcium intake, I choose to not force it on the tortoises. The all too familiar practice of dusting each meal with calcium powder can cause long term problems down the road. Instead, a constant supply of cuttlebone is kept in every enclosure with tortoises of all ages. The animals will nibble the bone as they feel the need. Only occasionally will we dust the food items with powder. In the case of growing youngsters and gravid females we do this twice weekly. As with any turtle or tortoise, they do not like to be held. By nature, these tortoises are low to the ground therefore; they should be picked up when absolutely necessary. Soaks, cleaning of the enclosure and health checks are reasons for handling. They are an easy-going, friendly and interactive species but like all reptiles, should never be overly stressed. Depending on the size of the indoor enclosure will determine on how often it should be cleaned out. When soiled and in need of freshening, the old bedding can be scooped out and thrown away or spread out in a flower garden. Various disinfectants are available to clean the enclosure with but be careful especially if the animal’s home is made out of wood. Fresh bedding should be added back in once cleaned out. of course water dishes and food dishes should be cleaned daily! A common misconception regarding tortoise keeping is thinking they must be kept very dry. This is in fact not true and we now know that pyramiding (unnatural, lumpy growth of the carapace scutes) is directly linked to improper humidity levels along with insufficient hydration. A diet rich in protein will eventually cause renal failure and offering too much fruit will bring on diarrhea or even an outbreak of internal parasites.